EHX 12AT7 Large plate format, superior dissipation over the originals. Perfect for reverb and dri..
EHX 12AT7 Gold Premium gold pin version of 12AT7. Large plate format, superior dissipation over t..
EHX 12AU7 Medium-Mu twin triode for use in preamplifier and driver circuits. ..
EHX 12AX7 High gain preamplifier tube with ultra low noise and detailed, musical tone. Unique spi..
EHX 12AX7 Gold Pin Premium gold pin version of 12AX7. High gain preamplifier tube with ultra low ..
EHX 5U4GB Straight bottle full-wave rectifier. 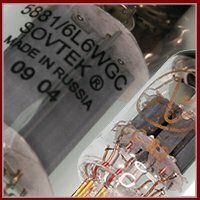 ..
ΕΗΧ 6550 Rugged beam tetrode power tube used in Ampeg SVT, Sunn, and hi-fi amplif..
EHX 6L6GC Beam power tetrode modeled after the vintage RCA 6L6GC "blackplate". Features..
EHX 6V6GT Beam power tetrode with a specially developed cathode coating, careful alignment of the..
EHX EL34 Most common power pentode found in British amplifiers such as Marshall, Hiwatt, Laney, a..
EHX EL84 This power pentode is the perfect replacement for the VOX AC30 output tubes. A recommend..
EHX KT-88 High power kinkless-tetrode for use in amplifiers such as the Marshall Major. This tube..
EHX KT-90 Absolutely the best KT90 ever developed. This beam power tetrode can be used in place o..
JJ 12AT7 Tesla / JJ Tube JJ Red Label. A. F. DOUBLE TRIODE Base: NOVAL Uf = ..
JJ 12AT7 Gold Pins JJ Gold Premium Tube Factory selected tube with gold pins. A. ..